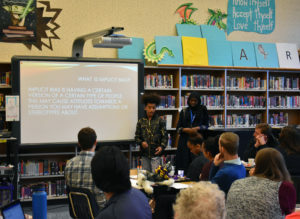 Inspirational Workshops has partnered with King County Best Starts for Kids to expand trauma-informed and restorative practices in schools, beginning with Garfield High School and Washington Middle School in Seattle to offer the Trailblazers Program: youth of color blazing the trail for others. The Trailblazers Program, created by Inspirational Workshops founder Theresa Hardy, is designed to empower underrepresented students to gain confidence that will support them with navigating institutionalized racism. Trailblazers introduces youth to social justice awareness and elevates student voice. Now that the state budget negotiations have finally crossed the goal line, I am happy to report that our legislature has made a huge investment in K-12 education! Thanks to your advocacy and support, schools with historically underserved students will get much-needed additional help. 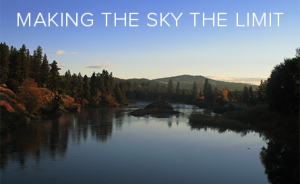 Read more about the legislature’s solution to the Supreme Court’s McCleary decision in this blog by Daniel Zavala, LEV’s director of policy and government relations. Be a part of this landmark moment! Help ensure that the McCleary decision is implemented to benefit every Washington student by making your gift today. Also, LEV interviewed Washington state Superintendent of Public Instruction Chris Reykdal about his long-term vision for K-12 education. And we’re hosting a free Lunchtime LEVinar July 20 on how adverse childhood experiences (ACEs) and complex trauma impacts student learning. Summer learning loss, what is it? School is out and the sun is shining! While summer is filled with lots of fun, time away from school can have a negative impact on students. Summer learning loss occurs when students don’t reinforce what they have learned throughout the school year, leading to a loss in knowledge and the need for teachers to spend the first weeks of school re-teaching skills that students learned the previous year. While there are many factors that come into play, some students lose over 2 months of math and reading knowledge during the summer. Fret not! Despite this, there are ways that parents can help keep their kids engaged in learning all summer long. Here is our guide to free (or nearly free) ideas and resources to help keep your little learners, elementary schoolers, and teenagers engaged in learning all summer long. As I walked out of the school, I realized I had to be honest with myself—the status quo was never going to work. Cut to five years later and Jane and I have pretty much worked it out, with the help of friends. Quite a bit has happened that you can read about here and here. Jane’s nearing the end of her high school career and the girl who no one wanted to let out of the resource room has tested into college-level English, gotten her driver’s license, and learned to make friends and plan for her future. 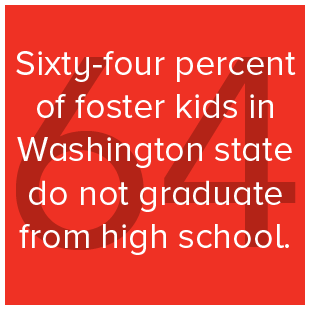 According to OSPI, sixty-four percent of foster kids in Washington state do not graduate from high school. At the League of Education Voters (LEV), we recognize all of the hard work that you do toward improving public education across Washington state. We are pleased to announce our Activist of the Month for July: Ashley Guerra. 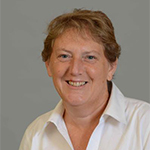 Read more about her experience leveraging technology to improve parental involvement in education. 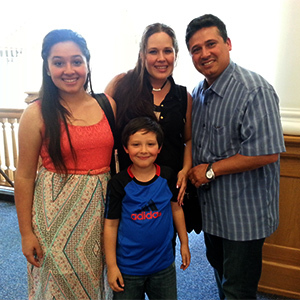 The Guerra family at the June 6 State Board of Education forum. From left: From left to right, Ashley, her younger brother Julito, her mom Yelenys, and her dad Julio. Ashley Guerra just finished her first year of high school, so it might surprise you to hear that we chose her as our Activist of the Month for July. But it won’t surprise you for very long. Ashley recently testified at the State Board of Education’s forum on the updated high school diploma for Washington. Her focus was parent engagement. Her goal to increase parent engagement began as a school project at Kent-Meridian High School, which has the lowest graduation rate in Kent. Ashley and her peers decided to try to find a way to improve Kent-Meridian’s graduation rate. Rogers High School in northeast Spokane had a graduation rate of 50 percent in 2010. This year, the graduate rate was 85 percent, an increase of 35 percent in four years. What changed between 2010 and 2014? Not the student body. Seventy-five percent of students at the high school are eligible for free and reduced lunch (FRL). What DID change is how students prepare for high school and life after high school. Rogers High School is in its sixth year of a Navigation 101 grant from College Spark Washington, and they have also implemented the AVID program in their school. Both Navigation 101 and AVID are programs designed to prepare students for college or career. One aspect of both of those programs is the High School and Beyond Plan, used to help students chart a path through high school to achieve their post-high school career goals. The High School and Beyond Plan is also one part of the newly updated high school diploma for Washington, which was passed during the 2014 legislative session. The League of Education Voters is working with communities across the state to ensure that the implementation of the new diploma is as effective as possible. 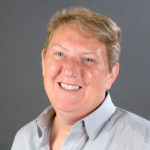 Chris Korsmo, CEO of the League of Education Voters, submitted an op-ed to The Seattle Times‘ Education Lab yesterday. It was published in The Seattle Times print edition on June 20. In her column, Chris argues that the definition of “basic education” in Washington is too narrow—it does not include early learning or higher education. Read below for an excerpt, or read the entire column online. At the League of Education Voters, we support an ample, equitable, stable education funding plan. While we supported the re-definition of “basic education” developed in 2009 (it includes smaller class size, full-day kindergarten, transportation, materials and supplies) upon which McCleary is based, we advocated that the definition should also include early learning and higher education. During the past two years, we have grown increasingly uncomfortable with the current definition of basic education. It is neither ample nor equitable. And thanks to our over-reliance on local levies, it certainly isn’t stable. We need a definition of basic education that puts students and their learning at the center. Read the entire op-ed on The Seattle Times website. At the League of Education Voters (LEV), we recognize all of the hard work that you do toward improving public education across Washington state. We are pleased to announce our Activists of the Month for April: Sarah Butcher, Jennifer Karls, and Beth Sigall. Read more about their experiences as strong advocates for special education. During the 2013 legislative session, many of you helped us pass a law (SB 5946) that makes school discipline data public and limits the number of days that students can be removed from class. 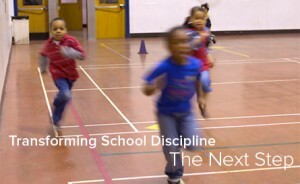 That was the first step in transforming school discipline policies. Now it’s time to take another. The Office of Superintendent of Public Instruction (OSPI) is inviting public comment on its implementation of the new law.